Silkworm pupae are particularly enjoyed by the bigger fish when the water is nice and warm. We find that the smaller fish prefer the Freshwater Shrimp. Nishikoi Health is a health promoting pellet food that enables your fish to recover from the stresses they may encounter from being moved, extreme temperature changes, water changes, poor conditions and a host of other conditions. Extensive research has shown that the ingredients and additives used in Nishikoi Health have a positive effect on the overall health and natural balance of our fish. Nishikoi Health is a highly digestible, tasty, wheatgerm based diet. It has reduced levels of protein and fat to aid rejuvenation of weakened fish at any time of the year. This feed is perfect to prepare your fish for the coming winter and to feed after this to get them on top form for the warmer months. Prebiotic's contain insulin, a polysaccharide with prebiotic characteristics. This is a good source of the positive micro flora needed to stimulate the growth & activity of the essential bacteria needed in the digestive system for overall fish health. Organic acids have also been added to help improve digestion & form a barrier to pathogenic bacteria. Beta-Glucans obtained from the walls of yeast cells. These aid natural disease resistance. Garlic well known as a health booster for fish and feeding stimulant for fussy feeders or fish that are recovering from stress or disease. Nishikoi Health is truly a year round food being used whenever the water temperature is over 9C and with our fluctuating weather conditions this offers a great advantage to all pond keepers to give their fish the utmost care whatever the season. Turbo growth boosting treat food, high in protein. Feeding protein is the way to make your fish grow very rapidly. With a protein content of 56% Medikoi Silkworm Pupae are one of the richest natural sources of protein. Rich in EFA's these oils are vital to keep fish in tip top condition. Mixed sizes of freshwater shrimp. An EXCELLENT natural food for great colours, skin and growth. HIGH nutritional value and easily digestible protein which dramatically improves the koi's internal system. The 'Red Gammarus Pulex' freshwater shrimp is an ideal supplement to your daily koi feed. They are high in digestible protein and carotene (vitamin A and it's provitamins) which stimulate the natural digestive process in koi. They contain a natural colour enhancer and have a high nutritional value. Gammarus Pulex are only found in the cleanest, most unpolluted waters in the world. 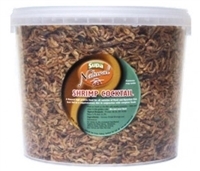 These particular shrimps are selected and harvested from the clearest streams in the Arctic. They cannot survive in any type of polluted water and so are very healthy and 'clean' food for your koi. It is best to feed the shrimps just before your normal koi food, as it will stimulate the digestive process enormously - it will also boost their vitality and colours. 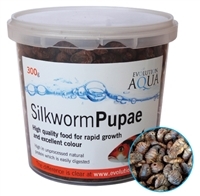 Evolution Aqua silkworm pupae are an excellent and powerful supplementary feed for koi. Made from the highest quality silkworm pupae, they are carefully dried out to retain all the goodness with no additives or preservatives included. This product is an ideal food due to it being rich in proteins. It not only increases the growth rate of your koi but also enhances the colours. Silkworm pupae can be fed as a daily 'treat' or as a powerfood at maximum of 30% of total food volume. Due to the high protein and fat content values, it is recommended not to feed below temperatures of 15C/59F. To improve the digestion ability of your koi further, put the pupae in warm water for half an hour before use.